Rosetta’s robotic lander Philae on comet 67P/Churyumov–Gerasimenko. Philae is a robotic European Space Agency lander that accompanied the Rosetta spacecraft until it landed on comet 67P/Churyumov–Gerasimenko, more than ten years after departing Earth. On 12 November 2014, the probe achieved the first-ever soft landing on a comet nucleus. Its instruments obtained the first images from a comet’s surface. Philae is monitored and operated from DLR’s Lander Control Center in Cologne, Germany. Several of the instruments on Philae made the first direct analysis of a comet, sending back data that will be analysed to determine the composition of the surface. The lander is named after the Philae obelisk, which bears a bilingual inscription and was used along with the Rosetta Stone to decipher Egyptian hieroglyphs. As of June 2015, Philae remains shut down and in safe mode due to reduced sunlight and off-nominal spacecraft orientation at its unplanned landing site. The reduced illumination is insufficient to power its systems, rendering it incapable of communicating with Rosetta. Mission controllers hope that additional solar energy falling on the solar panels by August 2015 may be sufficient to reboot the lander. 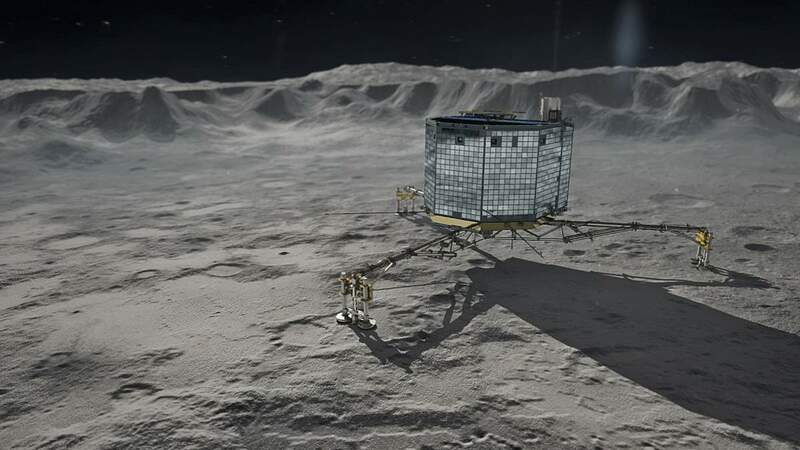 The National Aeronautics and Space Administration (NASA) also celebrated Philae’s awakening on their facebook page.